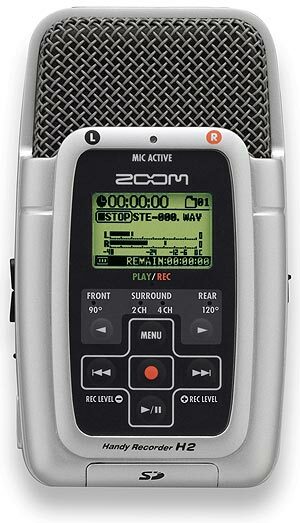 A low cost stereo sound notebook in an easy-to-use, ultra-portable form factor, the Zoom H2 enables you to record audio in a variety of applications. From seminars and conferences, pod-casting, musical performance, song writing sessions and rehearsals, the H2 will do the job when you're on a budget. And no matter what kind of music you perform or the instrument you play, the H2 can cut it reasonably well for the money. 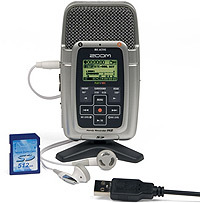 The H2 records on Secure Digital (SD) media and a 512MB SD card is included. 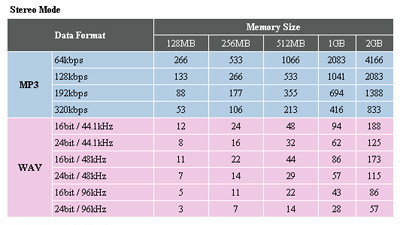 With a 4GB SD memory card, the H2 provides up to 2 hours recording at 96kHz, 6 hours at 44.1kHz, or up to 138 hours in MP3. Store your recordings on a PC or Mac with its USB 2.0 interface. And you can use its time stamping function for reference during production. 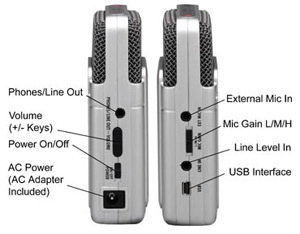 Or use the H2 as a USB Mic or digital audio interface for recording directly to a computer. That's all it takes to start recording! The H2 is very easy to use. One button recording, gain controls on the side and an intuitive user interface mean you can always capture the moment. Set your levels, push record and go. It's that simple. Or use the Auto Start and Auto Gain Control functions to ensure complete capture at the right level. And if you need to fine-tune your levels on the fly, there are gain control buttons on the front panel. A clear, backlit display features recording levels, time code, file name and remaining battery life. LEDs indicate Front, Rear, 2 Channel or 4 Channel modes and the recording angle: 90°, 120° or 360°. An Active Mic LED is on the front and back of the H2. Transport controls include one button recording, playback and pause, fast forward and rewind. Use the Menu key to enter the control menu and the cursor keys to navigate through the feature sets. Within the menu you can set recording parameters such as direction and polar pattern, activate the Auto Start function and set file format. Once you have your recording/s play them on your home audio system via the H2's mini-jack stereo output or listen to with headphones. Or use the USB interface to move your recordings to your Mac or PC to listen, edit and share. The H2 has 4 mic capsules onboard for 360° recording. With 4 mic capsules in a W-X/Y configuration, for a small device it has pretty good stereo imaging. 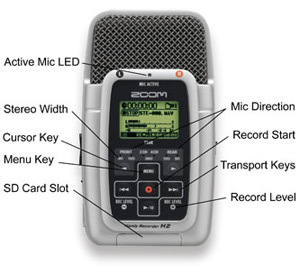 For maximum flexibility, you can record from the front of the H2 and at 90°, or the rear of H2 at 120° in up to 96 kHz/24-bit WAV format, and in MP3 up to 320 kbps. Additionally, you can record 360° in 48kHz/24-bit format which will allow you to convert your recordings to 5.1 surround. It's almost too small! The H2 weighs 4 ounces and fits in your pocket for the ultimate in portability and convenience. Two standard alkaline AA batteries will give you 4 hours of continuous operation and a backlit display means it's always easy to use in any situation.